On 24th August our car broke down. Turned out a bolt had sheared from the crankshaft (a fault with this model apparently!) One month without a car later… some good friends volunteered to drive us (for two hours) up to Tripoli in Arkadia to collect it from the garage. Don’t ask… it’s a long story! Until then, my only impression of Tripoli had been from speeding by on the motorway, or from a 15 minute comfort-stop at the bus station. Neither had been overwhelmingly positive…. 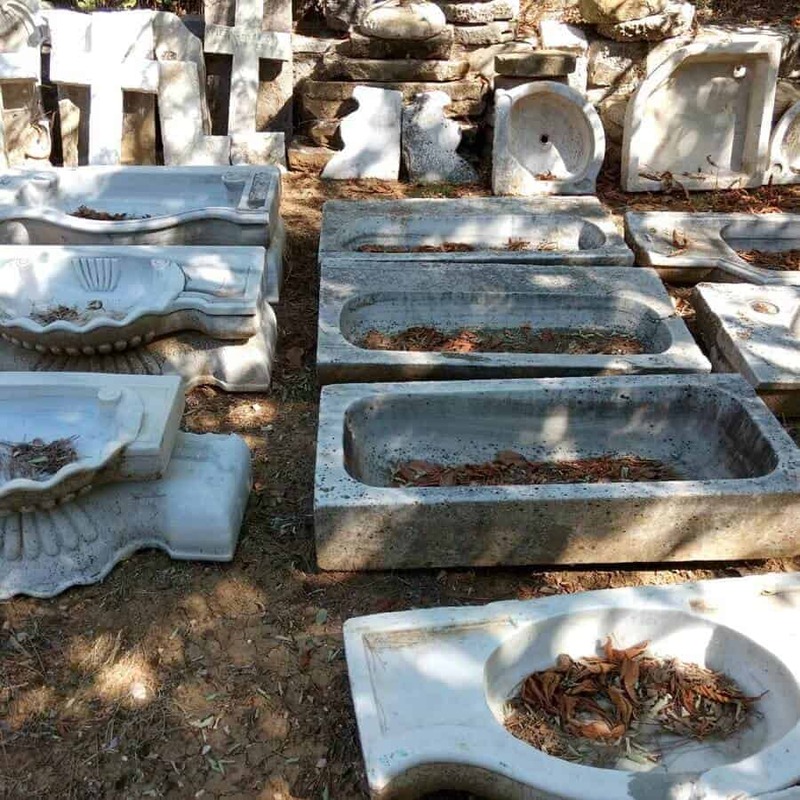 We’d long heard there were ‘antique shops’ somewhere in Tripoli, so decided to make a day of it and check them out. A quick google search led us to this place, billed as ‘The Monastiraki of Tripoli’, so we headed straight there after picking up the car. 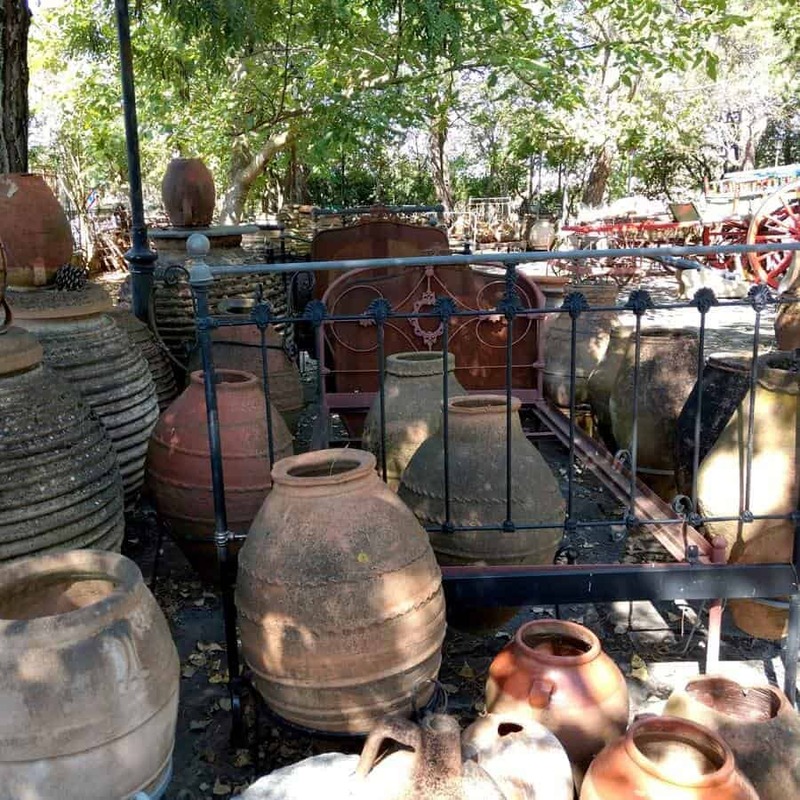 Google maps show the ‘Antique Emporium’ as being located near the Jet Oil garage on the Tripoli-Sparta road. It’s actually at the Cyclon garage on the same road. Or rather it is in the garage, or part of the garage… or the garage is part of the antique shop… it’s hard to say which. I don’t know what we expected but it wasn’t this. There is so much stuff – a lot of it outside under the trees! 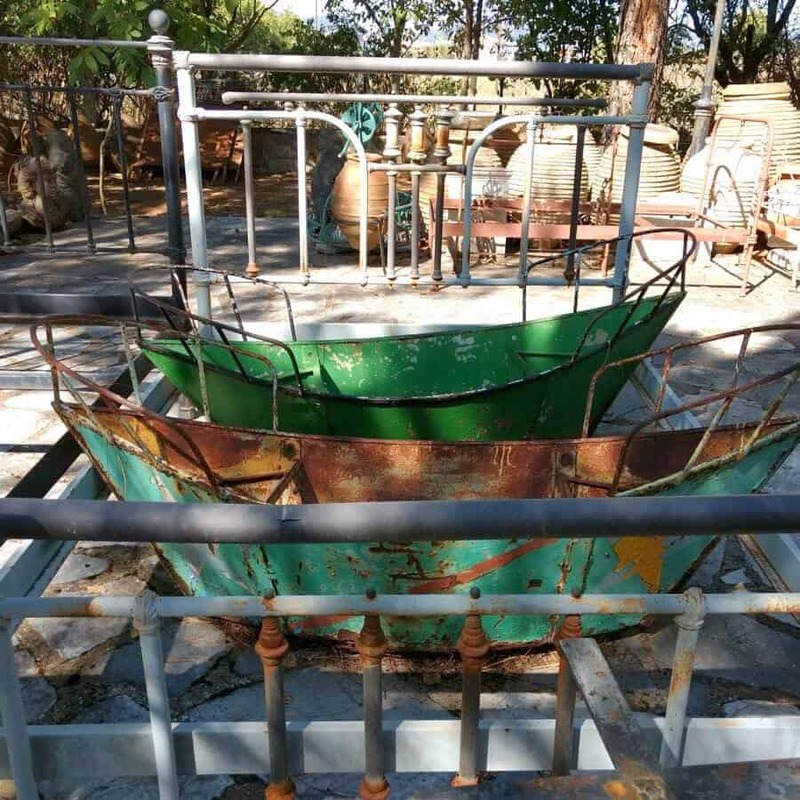 Fabulous old metal beds line the garden, as do rows of beautiful marble sinks and hundreds of pots of all shapes and sizes. 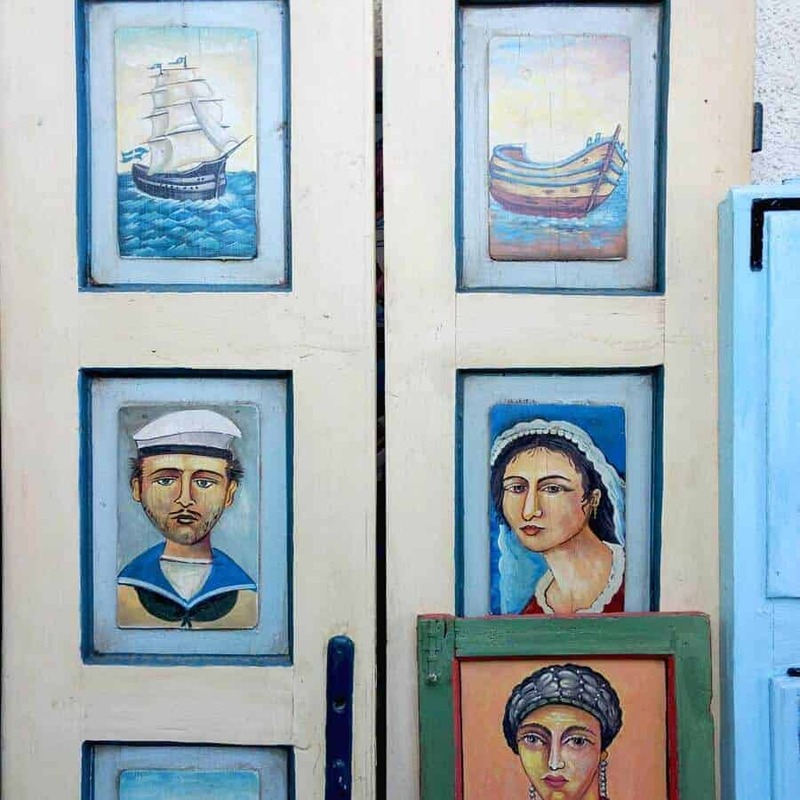 Gorgeous wooden doors and linen chests are propped up here there and everywhere – some elaborately painted with portraits and village scenes. 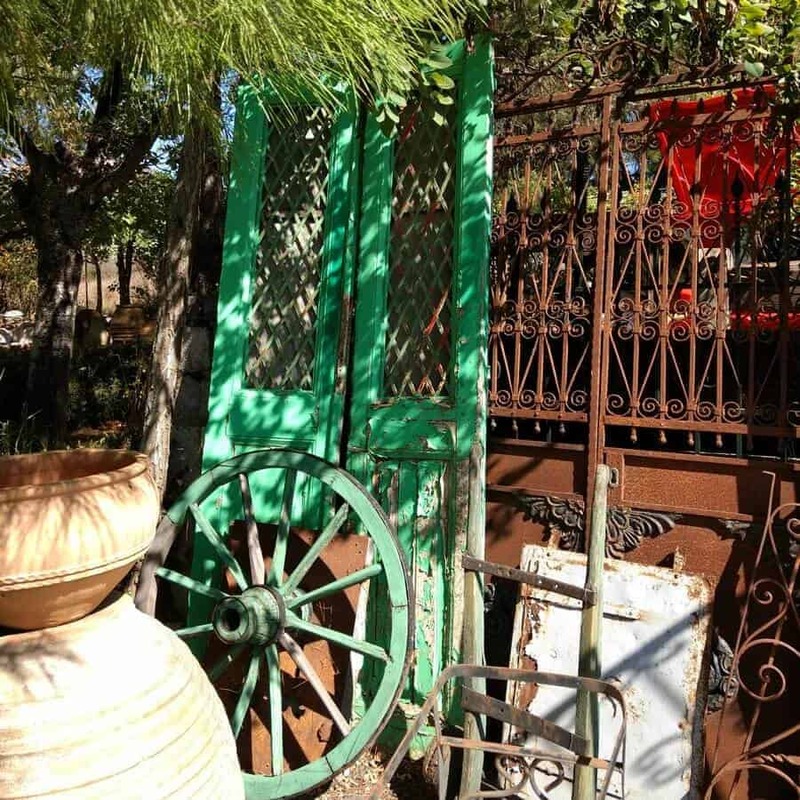 Ancient carts, donkey saddles, wagon wheels and an array of metal domestic objects litter the garden. Chandeliers, hanging lamps and ornaments line a covered corridor leading to the inside of the emporium. It’s hard to take it all in as it’s such a jumble of style, object and period. Inside there’s a lot of furniture – some restored and some decoratively painted – presumably by the guy I met in the garden who was quickly painting some large goat bells whilst working on a floral painted cupboard.There are some fabulous traditional wooden items here, including giant spoons and bowls and bread-kneading troughs. 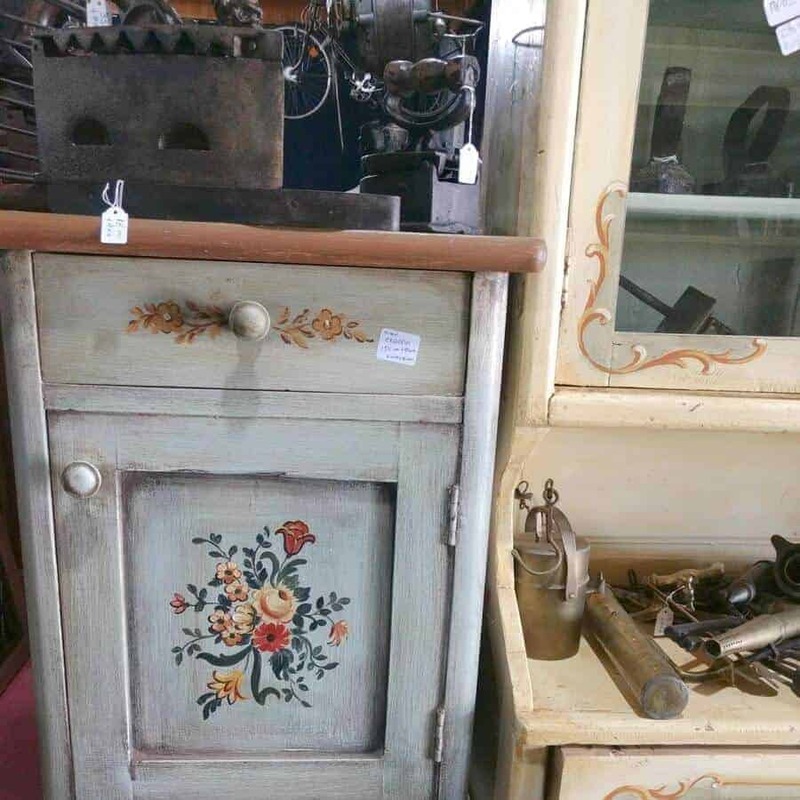 There’s everything from vintage children’s toys to mirrors and oil lamps… plus a surprising number old bicycles! There is a cafe of course, complete with an old juke box, which took me right back to my 1960’s childhood. (We used to have one which played The Beatles and the Stones in a cafe my family owned in Scotland). Here in Tripoli the vintage machine played old singles by Katzatzides and other old-school Greek singers. Having offered us coffee and drinks, the owner played us a random number – the sound was rich, scratchy and full of emotion. As an artist, I could easily spend days on end in this place, sketching and listening to the old jukebox. We took our leave and headed to the centre of the old town in Tripoli. By now it was lunchtime so we didn’t have time to explore the shops but the place had a very pleasant feel and we had an excellent lunch at Cafe Potiraki which was recommended by the guy in the garage!